Your niche is our standard. Quick and cost effective, we stock lenses others don’t. 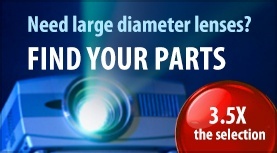 Our specialty catalogs offer micro optics down to 1.0 mm and other hard-to-find optics. We source from 21 overseas vendors so you don't have to. Ross Optical is a top-ranking supplier for OEMs in medical devices, automation, and other industries. We provide custom optics and assemblies, from design to fabrication, coating, and assembly. Ross has helped companies simplify complex assemblies, saving money and improving quality. Our ITAR registered facility offers white room assembly and inspection to your specification. Ross Optical produces micro lenses with diameters from sub-millimeter to 6.0 mm. We work with each customer to provide the micro optics lenses and other components that meet their requirements. Technologies from mobile phone cameras to medical devices demand smaller, lighter, and higher performing optical systems. Aspheres can help reduce the cost, weight, and complexity of these systems. Achromats cancel both chromatic and sperical aberrations. Ross has one of the largest selections of standard and custom achromats available in the industry. Your product performance depends on a reliable partner. From small volume standard optics for product development to OEM contract assemblies, Ross Optical improves your time to market and product performance. Design: Complete optical/mechanical design and engineering when you need it. We can help with everything from systems review to creating technical requirements, often eliminating parts and improving performance. Sourcing: Whether it’s a stock item sourced from one of our 21 optical manufacturing partners around the world, or custom manufactured at our U.S. facility, we deliver the right optical solution at the cost and quality your product demands. Inventory: We manage your optics inventory to help you improve profits and cash flow and avoid supply chain headaches. Inspection: From spot to 100% inspection, customers tell us our quality control is even better than theirs! Start with our specialty standard optics catalog, fill out a custom RFQ, or call our customer service line at 1-800-880-5417. Whatever your needs, we can help guide you to the best-fit standard or custom-designed optical solutions. "I give Ross high grades on customer satisfaction." "Out of all our vendors, Ross is one of my favorites to work with."